‘No teacher should be allowed to teach without having attended methodology courses. All my teachers have attended courses at CELT Athens as well as a tailor made seminar programme which was specially designed for my staff. Lessons have stopped being routine at my school. Are you interested in offering your staff the opportunity for some teacher development? CELT Athens can organize a workshop, a one-day seminar, or even a whole course especially for you and your teachers. CELT Athens has run a multitude of INSET (in-service training) courses for some of the finest foreign language centres throughout Greece and abroad. We pride ourselves on having contributed to their excellent reputation for quality in foreign language education. cost much lower than a face-to-face event. What is an INSET Programme? *INSET stands for in-service training, i.e. 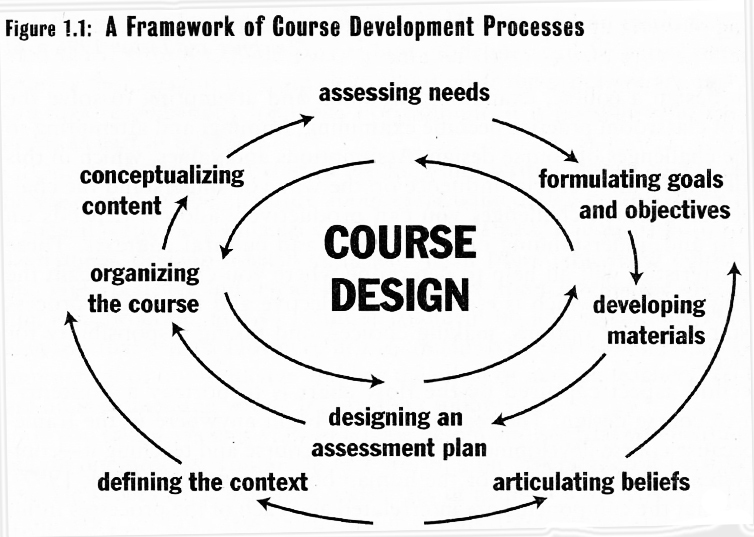 the teachers are training while working and the training is offered as part of their continuous development. Sessions are usually held at the premises of the school or association or group of teachers, lthough it is possible to run them at CELT Athens if requested. CELT is centrally located and has excellent facilities, including an extensive ELT library for teachers, teacher trainers and researchers. 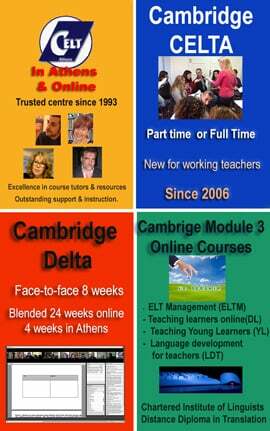 CELT Athens has extensive experience of running such programmes. Read below to see the names of just a few of the foreign language centres we have run such programmes for and also view some of the comments of the Directors of Studies/School Owners. Apart from the fact that the seminars and workshops are tailor-made to cater to the needs of your institution and your staff, students and course books you are using, these opportunities for teacher development generate motivation, enthusiasm and a team spirit. Teachers develop closer collaborative bonds, a desire to excel and the overall effect is an improvement in the quality of teaching and materials. The trainers are all highly qualified professionals with extensive teaching and teacher training experience. All hold postgraduate qualifications at M.A. level in TEFL, Linguistics, Applied Linguistics or both. All tutors are RSA Diploma holders themselves and train on all CELT courses including the the Cambridge DELTA Diploma and CELTA, as well as programmes offered to the PALSO teacher training programmes and to foreign language centres. Click read the comments of two school owners we have run INSET courses for and here to view the profiles of the CELT Athens tutors. How can you select topics for these workshops? Click to download this Seminar Checklist – a list of topics which you can submit on line or send by fax. Topics can be selected by a supervisor or the teachers, ideally both! One of the CELT Athens tutors can also assist you and your staff by visiting your school, discussing issues and problems with groups and individuals, or by being invited to visit a number of classes to identify areas of difficulty and possible topics for workshops. In-Athens rates range between 50-80 euros per hour of training, depending on the total number of hours and topic (the more hours, the lower the rate) and whether the course is run face-to-face or online. Out-of-Athens rates are only very slightly higher but travel, accommodation and subsistence costs must be added on. Special arrangements and rates are offered to schools which need a long term teacher development programme and regular meetings, e.g. once per month – these arrangements may also include regular observations of teachers in their own classes. 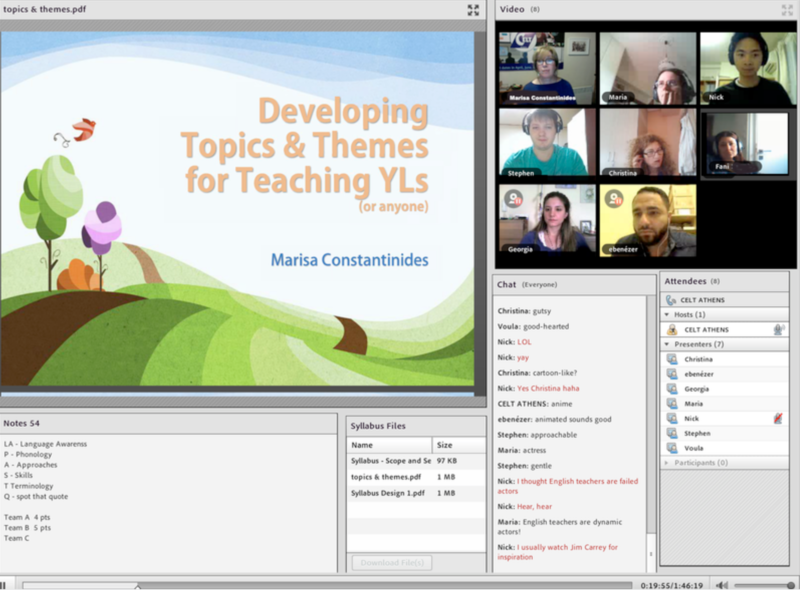 Online webinars and workshops for out-of-Athens foreign language centres are an ideal solution which cuts the costs considerably as we charge Athens rates. Please contact us for the technical requirements for teachers to participate successfully. And the cost for a whole course? Do bear in mind that some of the money that any employer pays into IKA for health insurance, is available for staff training through your local ΟΑΕΔ employment office.